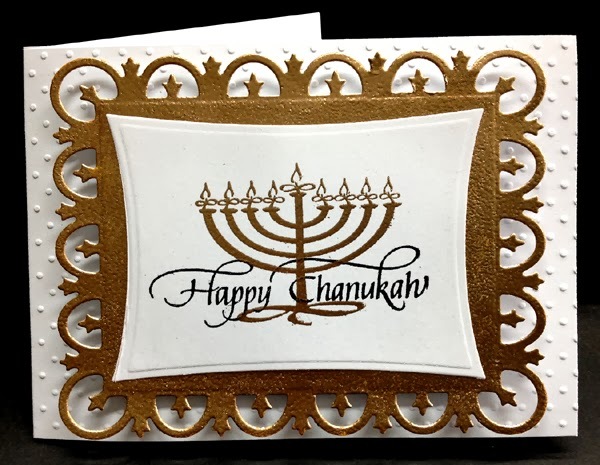 Suzanne from Quietfire Design came out with an ethnic set of holiday stamps, love them, and finally got a moment to use them... this is the 2nd of a batch of 8 cards I made yesterday. Die cut the Spellbinders "Fleur de Lis" rectangle from white cardstock, sponged the edges with Distress "Wild Honey" and embossed with "Queen's Gold" embossing powder. Adhered to card with 3D foam tape. 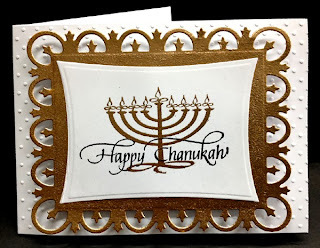 Stamped the Menorah and embossed with the gold. Stamped the sentiment with the black and clear embossed. Die cut with Spellbinder's "Wonky Rectangles" and adhered to card.